Did you know that PMS is about to have a birthday?! Thats right, on February 2nd, PMS officially opened it's doors and made this blog post. Isnt it crazy that we're almost 1 year old?! Personally, i cant believe it myself! So we're kicking off our birthday bash starting NOW! Thats right, today's theme is BIRTHDAY! 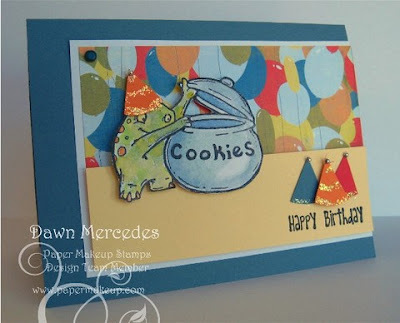 We have a fun and fabulous birthday sentiment set being released (all the cards you see today on the blog and by our Makeup Artists (thats the design team!) is using this set!!! And then we also have 2 party themed fairies and some cutie patootie, er i mean scary, monsters. 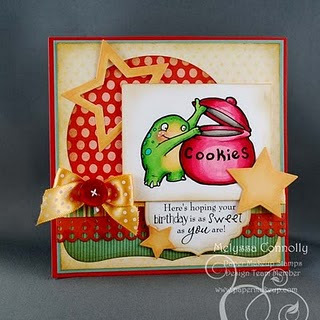 :) Now yesterday i was very bad (or typed up the post entirely too late) and forgot to mention the designers! YIPES! 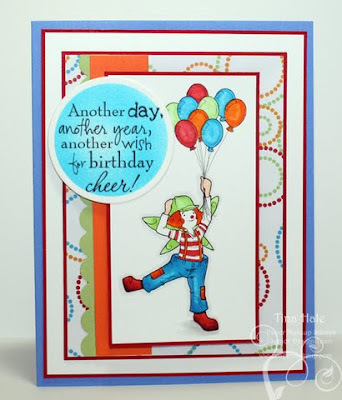 The birthday cheer set was put together by our very wonderful Shaela Odd. 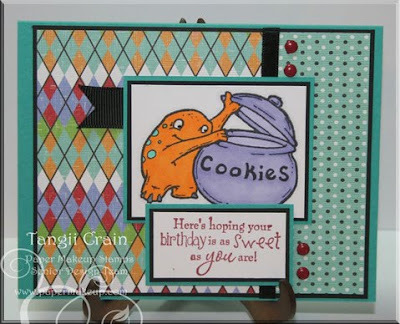 She also put together the Hugs and Kisses set you saw yesterday! On february 2nd, we'll have another party in our forum. We wont be having sneak peeks for a release in february, we're just releasing a LOT this month. :) There will be some new digis, some faaaaaaabulous sales on some of our earlier stamps, games, challenges, oh it's gonna be great! Now here are your samples of what's being released on January 14th at 8pm CST! Let's get this party started with BoBo the Clown Fairy! Isnt he fun?! BoBo is part of the Beautiful Day Fairy Collection designed by Diem Pascarella! Now who stole the cookies from the cookie jar? Who ME? YES YOU, couldnt be, then WHO? Anyone remember that song? Well, this monster isnt just for birthdays, but who can resist him? This little guy was designed by our resident monster guru, Steve Hammond. 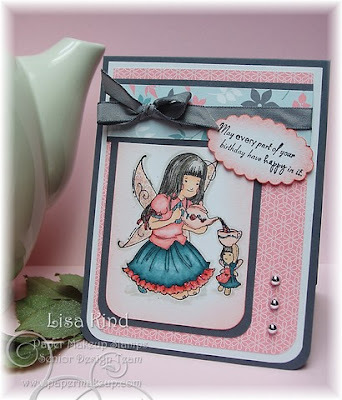 And now here's another sweet party time fairy.... this sweet girl is having a TEA PARTY! 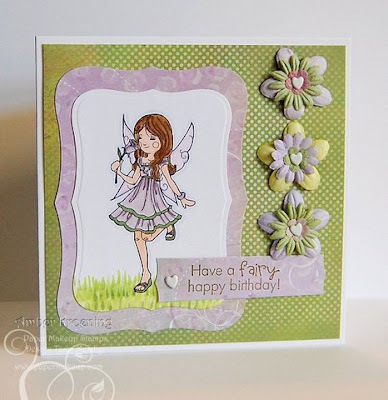 And while we're talkin' fairies... you saw Rose yesterday, but look at this sweet card with a birthday fairy sentiment! 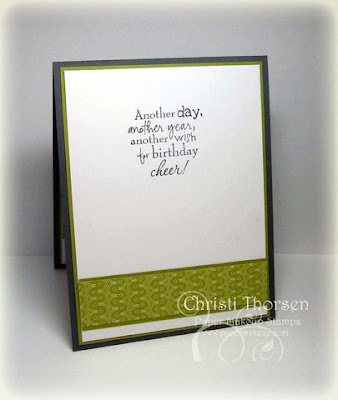 This sentiment comes in the Birthday Cheer set! Thats all for todays peeks! Be sure to tune in tomorrow for some fabulacious wordart! Would you like to win the entire release!!!??? Leave a comment here! All comments will be tallied together at out release party on January 14th, 8pm CST! You dont need to be present to win, but we'd love to see you there! Yay! You made the tea party fairy that I suggested. Love how she turned out. :) All the new releases look great! I love sentiment sets. 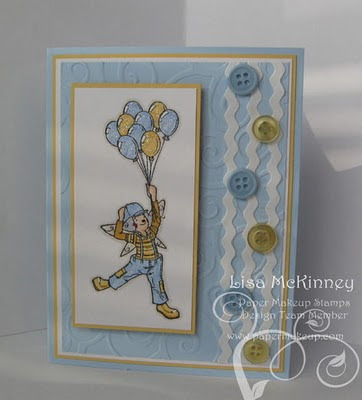 You can never have enough of them for stamping. Thanks for all the inspiration! Great cards by the DT! I am so in love with these little fairy's! They are so beautiful. I love that there are so many different ways to color them and get a totally different feel as well. Thanks for sharing! So we share a February birthday, huh? Very cool. These new stamps are so sweet. The clown is just precious. Very nice- I am certainly hoping to make it to the release party! Wow! I am so excited about this release. The previews are looking sooooo good!!! WOW! Happy Birthday and I, for one, am SOOOOOOOOOOOOOO glad you are! Love the cookie monster! Another lot of gorgeous stamps!!!! Oh Katie, these are all adorable! You should be so proud that your "baby" is turning 1!!!!! Wahoo! I love new releases!!! Each stamp is adorable. 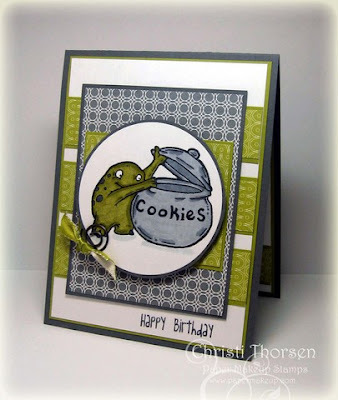 The 'cookie monster' cracks me up! the clown is cool and that cookies monster is cute as well nice job. I just found your blog through Lauren and can I tell you I'm so glad I did. The cards are adorable! I hope I win as I could use some "Happy" new stamps in my stash. Great card, super cute new images! WOW! So many incredible cards here! I am loving the new releases!! Super Fabulous stamps and cards~as always. 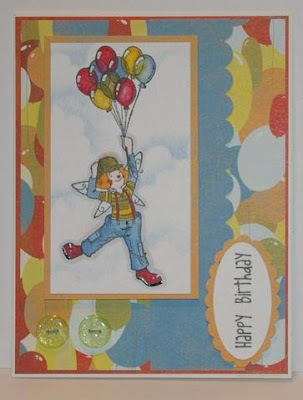 Such cute cards made with all these beautiful stamps! Fabulous samples!! 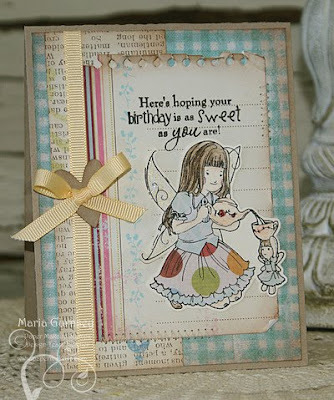 I am so excited to see the rest of the birthday sentiments set! wow congrats on a fabulous year! love the new images too! Wow! 1 year already?! Congrats :) ... Love the sneak peeks - can't wait for them to be released!!! I am such a HUGE fan of your stamps!!!! congrats on your birthday! Aaaaw! What sweet stamps! The clown is a cutie pie, but that little cookie monster cracks me up! Already a year old?! Time flies when you're having fun! Congratulations! - Mary R.
Love that clown. He is such a great addition to a party! Love the cookie monster and the fairies!! So adorable!